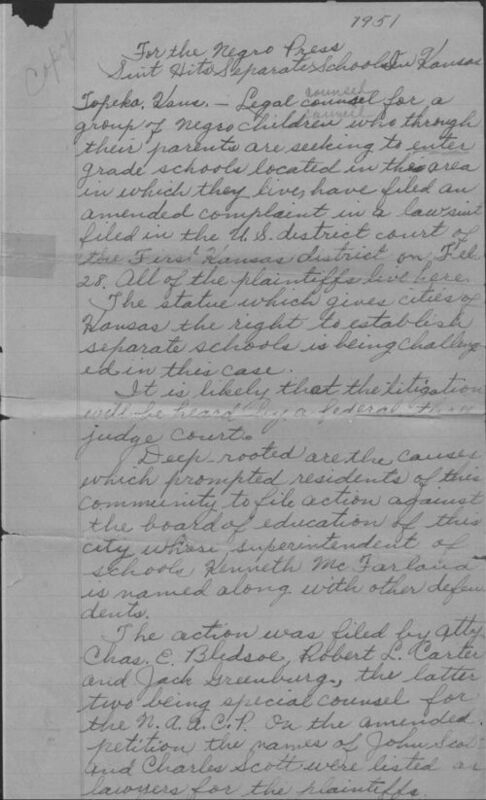 Copy of Lucinda Todd's 1951 handwritten news release outlining the legal actions underway, explaining the causes, and listing the names of the attorneys filing the actions associated with the effort of several Topeka families to have their children attend white schools. Todd's news release is an excellent summary of the issues that resulted in the Brown v. Board case. Consequently, it serves as an excellent introduction to the landmark case and the key issues Kansas's African-American community faced with regard to segregated schools.